I am feeling blah. For whatever reason January is never a great month for me. I don't know why, but I have horrible luck with appliances breaking and things going generally not in the right direction during this month. People also seem to be less than pleasant right now also. Today at the grocery store I was in the frozen food aisle. I was looking at some vegetables and the aisle was very narrow thanks to a display the store had set-up. When I was walking away I noticed there was a woman behind me that I hadn't noticed. Honestly, after two kids when I'm at the grocery store without them I tend to get in my 'me' zone. It is literally the only couple of hours during the week that I have to myself. I immediately apologized to the women and asked if I was in her way. Her response took me a little off guard. This woman was well into later life and used a profanity at me followed by the line 'of course you were.' Okay. I can understand if I was in her way. However, she could have said excuse me or brought it to my attention since I in no way say her since the door was open to the frozen food case. Second, why pull out the s word. Not necessary at all. I hope that my kids will grow up knowing that politeness is always the best response. Overall, I think so far I am already ready for the month of January to be over and it has just started. So I am feeling a little blah. Given my current winter mood I have been making a lot of soups and bean dishes. Last night I made a new recipe for Rajma (Northern Indian Kidney Bean Masala Stew) from a recent issue of Saveur magazine. This recipe has 17 ingredients. It takes an hour and a half of total time, 45 minutes of which is active and makes 4 servings. I did make a number of modifications. First I doubled the recipe. Four servings is not enough for my family, which includes two growing boys. Second I try to follow a recipe as much as I can but sometimes I am unable to find a particular ingredient. So with this recipe I left one out. I have used chiles de arbol when I lived in a much larger city. Finding them in my city just isn't a possibility, so I chose to not use them. Finally, since I was making this for my kids I seeded and diced my serranos. It would have been too spicy for my kids to eat otherwise. I also chose to cook my beans on the stove. I have a pressure cooker which I use for canning, but I find it a pain to take down and use for everyday cooking. I let my beans cook for two hours in order to be fully softened. I followed the remainder of the recipe as written. By leaving out the chiles de arbol and seeding the serranos this dish had a slight kick, without being too spicy for my kids. I let my beans cook down slightly so they were thicker than a traditional stew, but still worked well served over brown rice. My husband really loved this dish and was happy that it tasted different than the normal Indian curries that I make frequently. For the recipe go to Rajma. Thanks :) I visited you blog and followed! Come back again soon! I'm following you right now on Google Friend Connect!!! 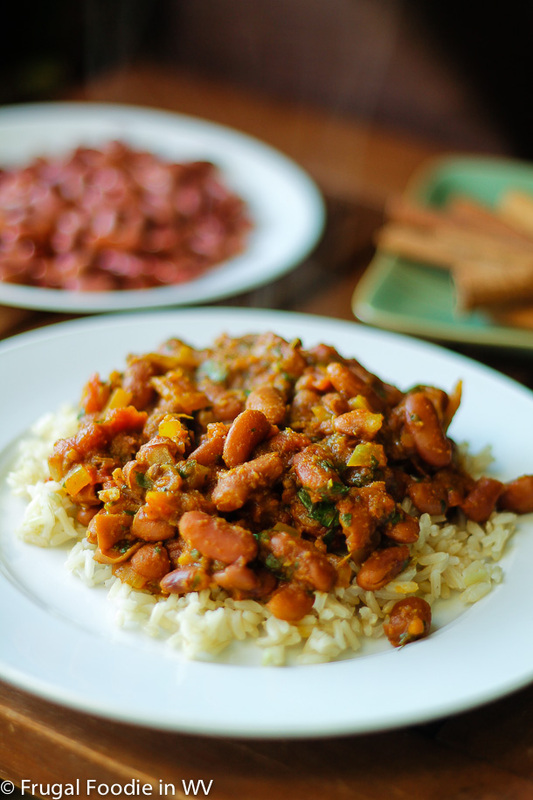 Kidney beans are one of my favorites!! And an hour and a half isn't bad, although I rarely have that much time to cook on a week night because of kid stuff, but maybe I'll give this a shot next weekend! I love indian food- this looks delicious! Thanks :) I love Indian food too! This looks really good to me and the Indian spices are just the thing for a January pick-me-up. I totally understand about your me time. I have to sneak mine in whenever/wherever I can. I agree, January can be a little bit dreary and Indian spices are great for a pick-me-up :) Glad I'm not the only one sneaking in me time! I just want to say thanks for the following. You food looks good, I always love to try different food especailly is they are simple. Thanks for following back :) Come back again soon! I am also following you as well. Sorry you've been feeling kind of down. January and February are pretty bleak months! I agree that Jan and Feb are a little bleak :) I am definitely ready for spring!